The RubberBond manual provides a guideline of the correct installation methods for RubberBondFleeceBack. It covers the most common details that are common to most flat roof installations. The manual is for reference only and is not a replacement for the in-house and on-site training that must be completed by every recognisedRubberBondFleeceBack contractor. 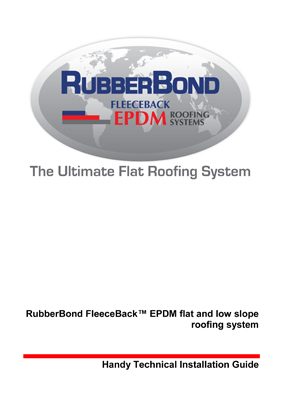 Visit our video library for installation videos for RubberBondFleeceBack EPDM. These videos are for reference only and a full workshop and onsite training must be completed before an installation is undertaken.